Sejal Group a name which spells Respect & Trust in our Industry was Incepted in the 1970's under the Able Guidance & Far Sighted Vision of Mr. Sevantibhai M. Shah and Mr. Chandubhai M. Shah. Our Journey has been marked with Unmatched Quality & Precision in Small Diamonds; which are further Assorted in Multiple Different Grades to Achieve Perfection to the Hilt. Our Assurance of 'True Value Diamonds' reflects in the fact that we pay Paramount Attention to Every Detail of our Diamonds; right from Procurement to Processing to Delivery, which includes a Mix of Both; Human & Mechanical Modes of Quality Checks. In 2006, we entered the Certified Diamond Category; prompting us to broaden our horizon. It has been our Constant Endeavor to Satisfy the Smallest of Client Demands & we Strongly Believe in Continually setting Higher & Higher Standards of Transparency & Integrity. 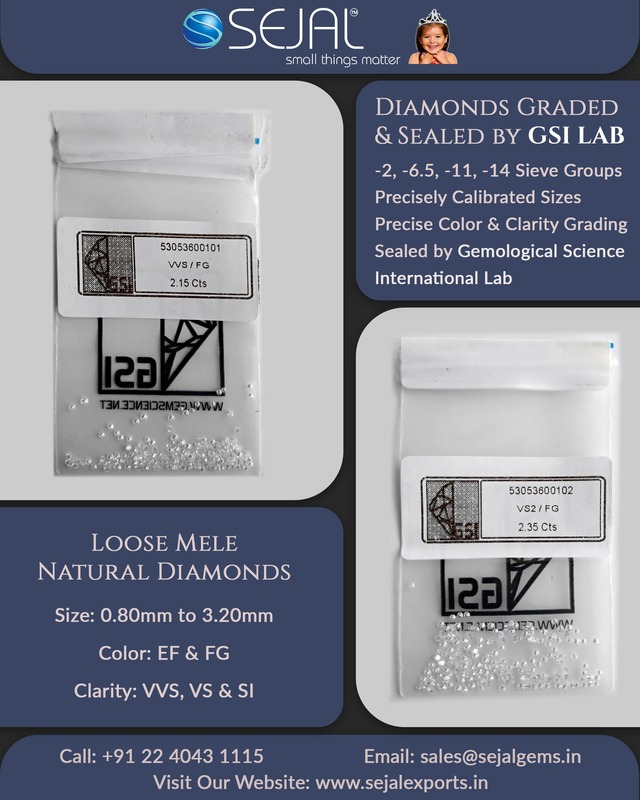 ‘Sejal Group’ is a Recognized Wholesaler of Loose Diamonds from Sizes as small as 500 pcs/carat to 10 pcs/carat in Large Quantities as per Client's requirements. We also deal in Certified Diamonds & Aspire to serve the Smallest of Client Demands with the Best of Customer - centric Policies. Stringent Quality Checks, both; Human & Mechanical Modes have been set - up across All Levels of our Company Structure; to ensure that We deal only in 'True Value, Natural Diamonds'. We constantly Thrive to Adopt Innovative & Sustainable Technologies to Improvise on the Quality of Our Products. Our Set - up helps us develop Products where Quality totally Blends with Quantity at some of the Most Competitive Prices Market can Offer. Satisfied Clients & Workforce are a Testimony of our Company's Constant Endeavor to be a Centre of Excellence for both Products & People. We feel Honoured to Serve You through these Years & Your Faith in our Services is a Testimony of our Company's Goodwill. 'Small Things Matter' has been Aptly Incorporated & Followed as Our Company's Core Ideology. Rigorous Assortments, Stringent Quality Checks, State - of - the - Art Facilities, Client - Centric Approach and Policies, Absolute Transparency are some of the Attributes that have helped us Scale Newer & Higher Horizons. We, at ‘The Sejal Group’; Constantly Strive to Adopt Strategies that are Solely Service - oriented to ensure Optimum Client Satisfaction. Sejal Group assures you, that it will be Our Constant Effort to Add Sparkle into Your Lives with ‘Our Values & Services’; Turning Precious Moments into Cherished Memories !!! © 2018 Sejal Exports India. All Rights Reserved.